This 24" x 36" acrylic painting on stretched canvas feels like it is breathing and in motion, flowing with colours and textures moving in similar and different directions. It's like watching the the sun of water burst forth with waves of water and undulating currents of colours of the rainbow of blues - deep ultramarine, sea greens and green blues, light blues, caribbean blues and sand whites. 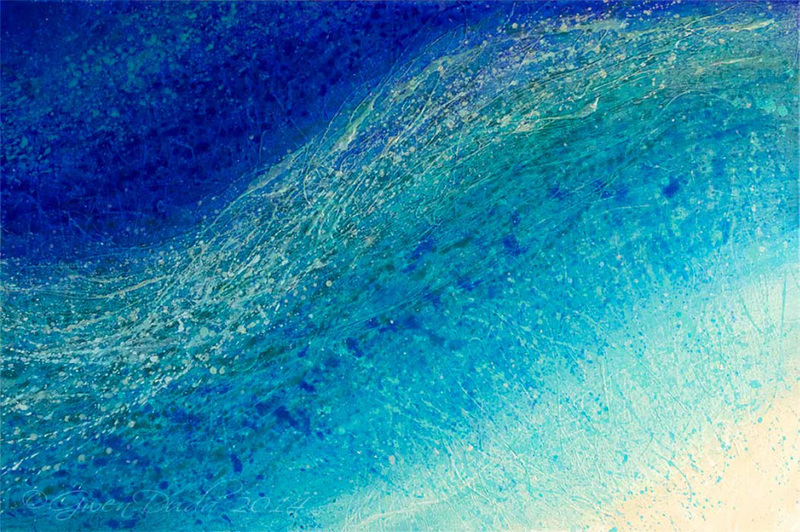 There's a ribbon of high texture that moves through this painting that has iridescent blues in it as well as more texture through out the painting to define the waves and splatters. This painting is an exciting and refreshing focal point for any room. It's like having a piece of the birth of the ocean in your home.